Does accepting yourself scare you? "Am I giving up?" "Will I ever be able to work towards goals ever again?" The real question is -- how can we find peace in the moment and have some dang goals in life to work towards? THIS is how - and honestly, it's the only way to achieve this balance. Want to chat with us to see how we might be able to help? Fill out this form and we can book a call www.bit.ly/tblsapply. Getting support can be hard. But getting out of the diet madness requires community and support! These things are so common but these little words are sabotaging your food freedom efforts. If you want to stop dieting you MUST stop saying these things..learn why and what to do instead so you can find wellness without the obsession. How to Marie Kondo your life so you can stop dieting and find wellness without the obsession! Tired of finding yourself binge eating every weekend? Here are 3 steps you can take to stop binge eating and start feeling more free around food. Please take a moment today to rate and review the podcast - this is how new women find us and learn that there is another way! We do not need to diet anymore. Your thoughts and beliefs create your reality. But what happens when your beliefs aren't all that empowering? You must shift them in order for anything to change. Tune in to learn how! Feeling stuck on your journey out of the diets and into food and body freedom? Do you think about food all day? Do you hate your body and you're ready for a change? These are the 3 steps you must take in order to make any sort of change in your life. YES - change is uncomfortable AND you can do this. Want in for our free training on Feb 11 (Monday)? Do you get trapped in all or nothing thinking? Freedom is the place in-between. But it can hard to get there if you are stuck in all or nothing thinking. Tune in to hear how to start getting out of this thinking so you can start on your way to food and body freedom, to really being able to have it all. There are 2 common distractions that get people stuck in their journey to ditching the diet and getting empowered in their relationship with food and their bodies. Listen in to learn what they are, how they can be avoided and what to do instead if you're ready to really move on with your life. Ever wonder why you can't just "get over it" and accept your body? This plays a big part in it. Interested in accepting your body and becoming an Intuitive Eater by summer? Check out our last ever session of the Intuitive Eating Academy starting January 20. Ep 037 - I’m afraid to see certain people after gaining weight! Worried about going home for the holidays or your 25 year high school reunion after ditching the diets and perhaps gaining some weight? We get it -- it can be scary to think that all these people are going to be judging you! Here is how to get through it and most importantly, heal to the extent that you don't even worry about this anymore! Want to reach out to see how we can work together? Send an email to hello@thebodylovesociety.com with your top 2 goals in your relationship with food and your body and we will reply with how you can make the next steps towards freedom! We did a poll on our Instagram asking about the #1 concern when becoming an Intuitive Eater and weight gain was pretty much the only answer. Diet culture has really taken a toll on us when we would rather obsess and worry about food all day than have the possibility that we may gain some weight (not that that possibility isn't there with dieting but the diet industry likes to pretend that weight gain doesn't exist in dieting). Here are some ways that you can work around these fears AND the truth about your weight. Let's face it -- weight gain is likely your #1 fear when it comes to ditching the diet and becoming an Intuitive Eater. This is the #1 thing that people seem to get hung up on - thanks for nothing diet culture! Here are some insights into how to move past that so you can truly become free around food and in your body. Ep 034 - Worried about Holiday Eating? Don’t Be. Worried about all the holiday parties and dinners coming up? You don't have to be. With these mindset shifts and practical tools you can rest easier as you go into this busy and food filled time. If you're interested in seeing if the Intuitive Eating Academy is a good fit for you click here -- www.thebodylovesociety.com/intuitive-eating-academy. Ep 032 - How do I take care of my body if I’m not trying to lose weight? Ever feel like you've just stopped taking care of yourself since stopping the constant quest for weight loss? Can you even envision what taking care of yourself means if you aren't restricting? Tune in to hear how you can take great care of your body and yourself without it needing to be about restricting food or hunting for weight loss. Want to move your body but aren't sure how since you only ever used to do it to lose weight? Tune in to hear about how you can move your body in an intuitive way and actually enjoy it! What is it really and what isn't it? We have a big perspective shift that we're sharing today and it's definitely something you're going to want to consider if you're working towards body acceptance. Thanks for tuning in! Please share the podcast so we can get the anti-diet message to grow and grow! Ep 029 - Is That Your Diet Voice Talking? We all have 2 voices (well if you've ever been a dieter you do). We have our diet voice and we have our true voice, that voice we were all born with. The problem with this is that dieting can become so ingrained that we can't tell if the voice we're hearing is our diet voice or your true inner voice. This diet voice can make us feel like we constantly need to be stressing about food, our weight and can make us feel inadequate. This is why we can get stuck in dieting for so many decades even though it isn't working. We're here today to help you tell the difference and how to deal with these voices! Tune in and hear another woman's journey in Intuitive Eating and Body Acceptance. Worried that you'll slip back into dieting on your way to Intuitive Eating? That fear makes sense: it's what's comfortable, it's what you know to do when you're feeling like you need to feel better. But don't worry we have some great tips on how to avoid falling back into the diet. Wondering what body image REALLY is? Want to know the 4 types of body image struggles and how to work through them? If you used to be a dieter (or are still working on getting out of the dieting cycle), you're likely a catastrophic thinker. What is a catastrophic thinker and how does it affect you? Tune in now to find out and learn how to get over it. Gentle Nutrition is the last principle of Intuitive Eating, it's also a slippery slope back into dieting. We explain here why you can safely skip gentle nutrition and keep on focusing on the other principles of Intuitive Eating. Contact us at hello@thebodylovesociety.com if you have any questions or are wondering how we might be able to help! We know that clothes can be a really difficult point when it comes to your body changing, especially if that invovles weight gain. In our dieting times, we were always looking to fit into the next smallest size and not fitting into our skinny jeans was a sure fire sign we needed to get serious again on Monday. We know we don't want that life anymore but what do we do now when it seems like we have to always be buying new clothes for this new body? Tune in now to learn how to cope with these changes just a little better. In this episode we share with you why focusing on your set point weight is damaging. As ex dieters and now fully intuitive eaters, we know you cannot become free around food without letting go of trying to control your weight (SPOILER ALERT: you dont have control over it anyway). Many people think if they stop obsessing over weight loss they will all of a sudden gain a bunch of weight, that is not how it works. Obsessing over it is actually what’s keeping you in the restrict/binge cycle which is actually what has you gain weight overtime. This is not to say weight gain is bad, but if your main goal is to lose weight, obsessing over it is not the way to go about it! You may think you are eating intuitively but if you are still terrified of weight gain or thinking about how IE might help you lose weight, you’re not, this is just another diet. In Intuitive Eating you’ve probably heard of the weight set point, this is discussed in intuitive eating because when you tune into your body instead of being on the diet rollercoaster your body WILL find a happy place to land, this is rarely your “goal weight” but it is a place your body can be comfortable and maintain for a long time. Your set point weight can be less than it is now, more or the same, it doesn't matter, it’s about finding stability NOT finding weight loss. This is where things can get tricky because people think, oh i've let go of focusing on weight loss, now i'm just waiting to get to my set point weight….. This is the same thing. NOTE: Your set point weight will change over time, from aging, circumstances, pregnancies, hormones etc. You will learn the reasons why waiting for that infamous set point weight is preventing you from finding freedom and balance with food and your body. Listen in as we coach Mary! Here is why you might want to stop. We chatted with Andrea as she continues on her journey to become an Intuitive Eater. This was a powerful call and we covered a lot but much of this journey comes down to dealing with the diet mentality. Our first Quick Coaching episode! In these mini episodes we will be sharing a quick coaching tip so you can move forward in your journey towards Intuitive Eating and Body Love with some tangible skills and mindset shifts. Today's Quick Coaching is about the grieving process - this is a vital step in the process that a lot of people miss and therefore get blocked from finding true freedom. Let us know if you did the activity and how you think it'll help you moving forward by emailing us at hello@thebodylovesociety.com. If you are looking for DAILY support so you can actually become an Intuitive Eater and feel confident in your journey you may be interested in checking out the Intuitive Eating Academy -- www.thebodylovesociety.com/intuitive-eating-academy . Does comparison hold you back on this journey to finding body confidence and food freedom? This is the episode you are going to want to check out. Learn how to think about things differently and learn a few tools so you can move forward and focus on your own life instead of getting into everybody else's. We sure did for a very long time, it has got to be one of the worst feelings as a dieter. It really feels like a failure when you're eating all the foods you were working so hard to avoid. In this epsiode we share what binge eating is, what causes it and how to start getting away from it and towards a healthier relationship with food. Have a special occasion you feel like you want to diet for but also know that it isn't going to work? Caitlin had this struggle leading up to her wedding but she got through it, is on the other side and is working on getting even stronger as an Intuitive Eater as a newly married woman! Tune in and listen to the end to hear 3 action steps YOU can take to get stronger in your journey as an Intuitive Eater and not fall back into old ways that just get you stuck in the dieting cycle again. Even if you've never been pregnant and don't plan on it this episode is a great insight into how Intuitive Eating can really be a life saver when you come across life changes that result in body changes. We're all going to age and have ups and downs in life and this all comes with body changes. So how can Intuitive Eating and Body Acceptance play a part in these changes? Tune in to see! Interested in learning more about the Intuitive Eating Academy? You can learn more here www.thebodylovesociety.com/intuitive-eating-academy or simply email us at hello@thebodylovesociety.com and tell us a bit about where you're at in your Intuitive Eating journey and we can go from there. Ep 010: Does Body Acceptance Mean Letting Myself Go? Does it feel like if you accept your body this means you'll just be sitting on the couch eating bonbons for the rest of your life? We're here to explain why that just isn't the case. Want to chat to see how we might be able to help? Shoot us an email at hello@thebodylovesociety.com and let us know a bit about you and what you're looking to achieve! Ep 009: What is Intuitive Eating? So... we got a little ahead of ourselves! We talk about Intuitive Eating but for those that are new to the idea or have never heard of it, we are now giving an overall look at the basics! Intuitive Eating is how we found food freedom and we know it's the way you can find it too (guaranteed; you'll find out why this works for everyone when you listen in!). To reach out simply email us at hello@thebodylovesociety.com, we're here to support you on this journey! Ep 008: I feel crappy...shouldn't I change the way I eat? I'm sure this has happened to you before. You're not feeling top notch so you instantly look to what diet you could go on or what food you could cut out of your life, right? But what if restricting your food isn't the answer? What if that is actually hurting your body and wellness, instead of helping it? Okay, so what should we do instead?? In this episode we talk about the alternative ways we can feel better, increase our feelings of wellness and even focus on health WITHOUT restricting or dieting at all. To reach out and tell your story simply email us at hello@thebodylovesociety.com, we are always here to support! In this week's episode we had a live coaching session with the wonderful Julianna. She is a woman from California who is new to Intuitive Eating but is so ready to leave the diets behind. The only problem? She still really wants to lose weight! So how can she move forward? If you also know that dieting is no longer in the cards for you but you still want to lose weight this episode will give you a lot of insights into how to move forward along with some simple action steps you can take right now! Be sure to join our free online community HERE! We would so appreciate it if you have a minute to rate and/ or review How to Love Your Body today! This is one way we can get the anti diet message out to the world even faster! Episode 006: How to distance yourself from diet culture! Feel like dieitng messages are everywhere and as you start this journey you feel like you can't escape it!?! We get that, that's why we created this episode all about what diet culture is and how you can distance yourself from it right now! Get all our tips to move forward with less presesure from this diet crazed world we live in! Dieting doesn't need to be as 'in your face' as it might be right now. Take our suggestions and you'll be amazed at how those messages can be quieted! Episode 005: Are you a normal eater or a disordered eater? A big thanks to Ellyn Satter for her great input on what normal eating is! A good place to start is our start here page to learn more about why dieting doesn't work and what to do instead. Another amazing resource is our Free Intuitive Eating Support Group! We are always open to talking if you want more info about how to become an intuitive eater, you can email us at hello@thebodylovesociety.com. We can also be reached here if you want to contribute any questions to a Q and A episode or to be coached on air! This week we are discussing the downfalls of programs like Weight Watchers (and the many others like it). Our main issue is with companies using the body positive and food freedom message to trick people into sign ing up for yet another diet. We share how to identify an authentic Intuitive Eating and Anti-Diet source from those using the message to trick us! Tune in if you're wondering WHY these programs are problematic and how to start shifting away from all diets. Learn more about Intuitive Eating on our start here page! On this page you will find a free resource guide and access to our Free Support Facebook Group. This week we talk to Denise, an amazing woman who is starting her journey of ditching the diet and loving her body. Writing an empowerment letter to yourself - Write to who you see yourself to be without all the diet rules and self doubt. Empower this amazing side of you, because it's already there you just need to start speaking to it. Redirect your thoughts using one pwoerful word! What is your word going to be? Write a bit about what this word means to you to make this exercise even more powerful. What did you think about this coaching session and these tools? We welcome feedback at hello@thebodylovesociety.com, also reach out if you would like a chance to be coached live on the podcast! Check out our Start Here page for more information! Episode 002: But how can I love my body if I hate it? 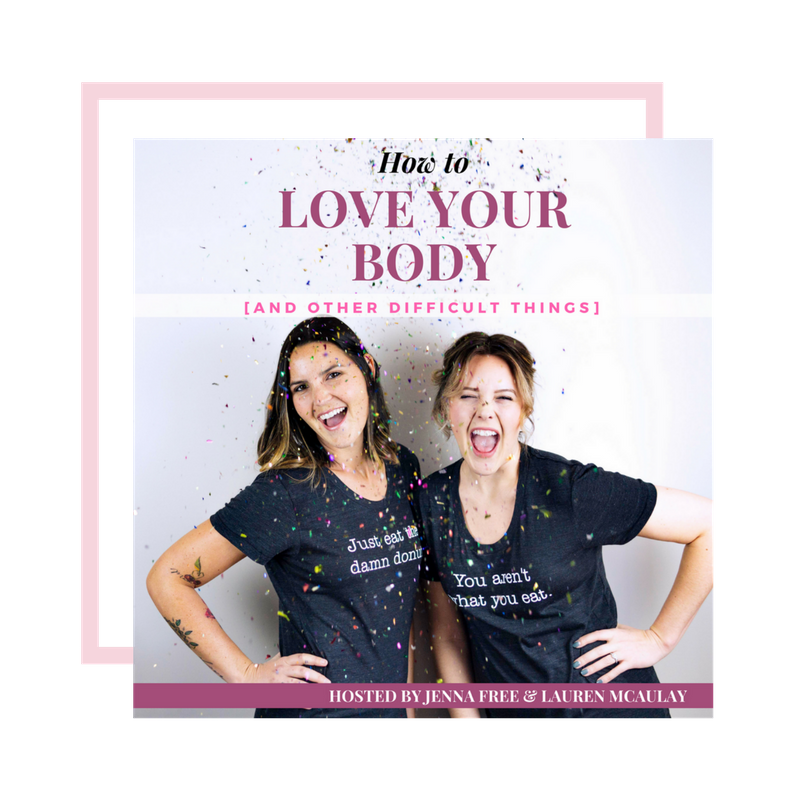 In this episode we talk about what it really means to love your body, the road blocks you might have getting there and a first few steps to begin the journey to a place of body peace! We mention our START HERE page which is a great place to begin on this journey with free information and resources about what we do and hwo it all works. As always, please help us by subscribing, rating and reviewing our podcast it helps a lot. Episode 001: What the hell is this all about? In this episode we share our personal journeys, why dieting doesn't work, what to do instead and more!